Happy Sukravara prostrations at the lotus feet of Our Dhanvantariswaroopa Sadgurudeva _/\_!! Turmeric in Tamil – மஞ்சள். Nityam Sri Cakra Pujane _/\_!! Pranams and thank you, Puttuji, for the beautiful Jaya MMS on Friday, which reminds us of Sri Chakra Puja, upcoming Makara Sankranthi (Thai Pongal), and Pujya Bala Swamiji’s Birthday !! “Sri Chakra Puja is an essential tool in the hands of Sri Swamiji to uplift His devotees. During the puja, holy water is being poured on the Sri Chakra. This water is refined and charged with spiritual energy and Ayurvedic herbs. The water is given to the devotees as holy teertham and should be considered as a powerful medicine. Even though its taste is bitter, its purifying results are remarkable. Makara Sankranthi (Thai Pongal ) Harvest Festival is celebrated by boiling rice in new clay pots decorated with Turmeric Kumkum and Ginger or Turmeric leaf . Women feed birds and pray for the well being of their brothers on a Ginger or Turmeric leaf. SGS Gems– November 18, 2014,Penal, Trinidad. HH, December 11, 2014, Naguvanahali. Turmeric is very good. 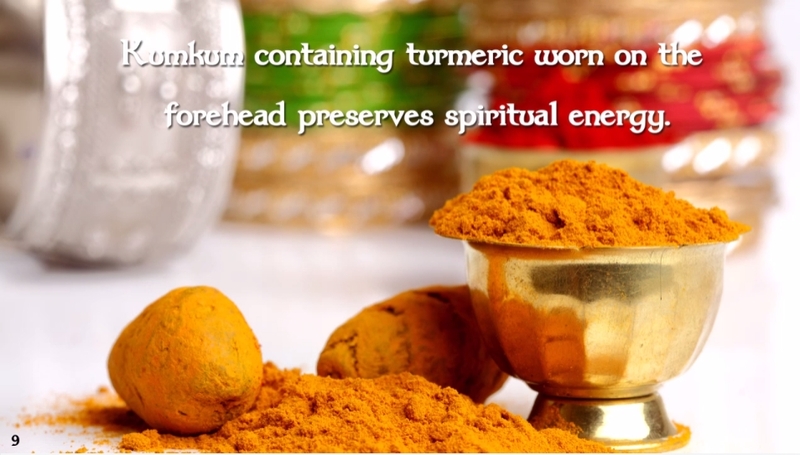 It prevents skin problems, and even prevents cancer. Infections it fights. Boils are healed if powder mixed with gingelly (sesame) oil is applied. Not too much in the hair. It may turn the hair white.USA researchers say South Indians have less incidence of cancer because of the use of turmeric in cuisine. Turmeric also keeps roaches and mice away. 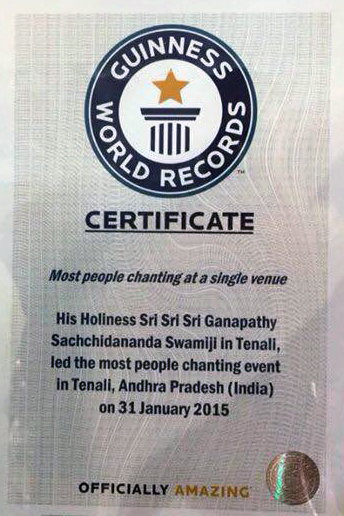 HH, January 1, 2015, Vijayawada. Every single Datta devotee must wear a dot on the Forehead starting today. I have made available specially prepared liquid that can be used for that purpose, without the use of any harmful chemicals. People become targets of evil eye. If you wear a dot on the forehead, it will absorb the negative vibrations that are cast upon you by people. Many people get a headache, fever, nausea or congestion suddenly as a result of someone casting an evil eye. This dot will protect you from that. It will remove the evil effect. You may also wear a mark with sacred ash/vibhooti. SBS Gems, Day 3 of Anjaneya Saptaham, Machilipatnam,India. In order to cover that spot(Lambika Nadi) for protection, we wear the dot on the Forehead. The scientists have recently discovered that at the time of death, the life force leaves the body from that spot, making a small sound. They have recorded the fact. That is why it is important to cover it, not only because it is good for yoga, but also to ward off evil eye. Cover it with vibhooti, kumkum, or sandal paste. At least for selfish reasons, to ward off evil eye, please put it on from today. Our scriptures have prescribed it both for worldly as well as spiritual reasons. We will increase the use of turmeric in our diets, Appaji ! !